No, this is not your typical RTP over-the-top headline. It’s true. It has come to this: The Tennessean, reeling from declining profits, a flawed business model and major reductions in the number of reporters, editors and other staff, decided not to use reporters at all on its largest article about one of the biggest political issues of the past and coming year. Looking for all the world like a regular news story, The Tennessean ran a weekend article under the headline: “Tennessee’s Common Core backtrack strands teachers, students.” Where the reporter’s byline should have been was: “Laura Camera, The Hechinger Report.” The article was in the News section of the paper, under the Education category – not in the Editorial or Opinion sections where it so obviously belonged. What makes it even more audacious is the sheer size of the article – nearly 3,000 words in all. It was the largest article in the newspaper that day, and possibly the paper’s largest single article on Common Core ever. Nowhere before, during or after the article did the Tennessean explain just exactly who was The Hechinger Report. But RTP will be more than glad to shine a little light. The Hechinger Report/The Hechinger Institute is an adjunct of the Teachers College at Columbia University (you remember Columbia U, don’t you? That’s Barack Obama’s alma mater). And The Hechinger Report was thoughtful enough to list its major donors. 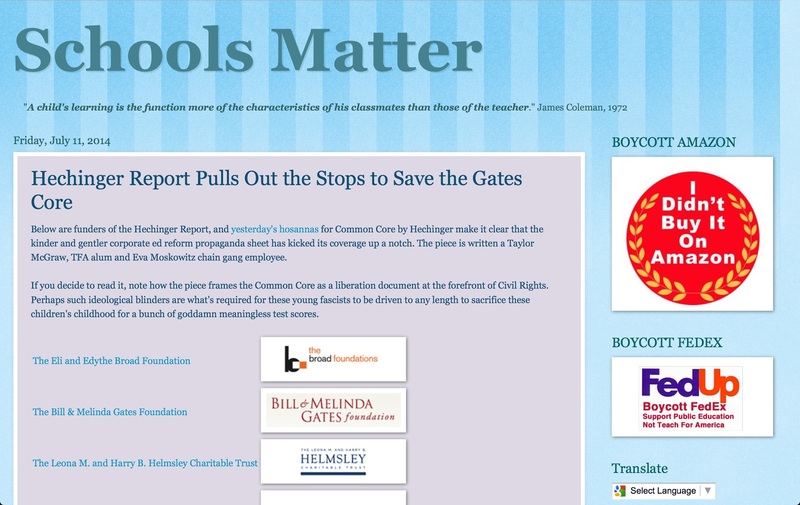 There are a host of liberal non-profits also attached to the Hechinger Foundation, like the left-wing Ford and the Joyce foundations, but the one we thought we would see on the list was not there: The Bill & Melinda Gates Foundation. Commodores sink the S.S. Common Core. On its web edition the Tennessean edition included a link to another webpage about the updated Vanderbilt study, but the editors used no quotes or numbers from the new study because that would obviously discredit the Hechinger story. How convenient. The Tennessean should be ashamed. But shame can only come from the self-recognition that the reputation and practices of the Tennessean have slid into an ethical and professional cesspool of its own making. Let’s see Frank Daniels The Third write about that. No wonder Chas Sisk told the Tennessean to piss off. The Tennessean is turning into a joke.